When you bring your yacht to Marlow Marine for any service work, our experienced and dedicated staff will talk with you about your needs and desires and will discuss with you the best methods for achieving your desired result. The yard foreman will give you an estimate of the time needed to complete your work-order and its cost and will work with you throughout the process to give you updates, recommendations and to answer your questions as they might arise. We have the craftsmen and women, certified mechanics, electronics experts and skilled painters to complete the job in a manner that makes your yacht look as if it has just been delivered new. Our capabilities are limited only by your imagination. View some of the custom work we have preformed on our customers' yachts. 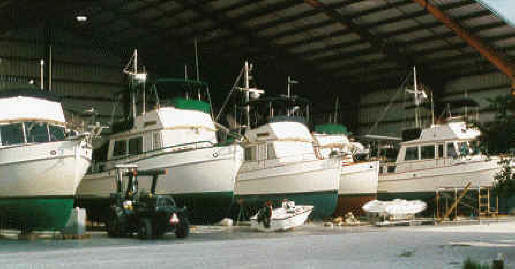 If you must leave your yacht for extended periods of time, consider storing it with Marlow Marine. Whether you have a 32' Grand Banks or 97' Marlow Explorer, we have a new storage shed which will keep the elements away, as well as our own protected harbor for boats kept in the water. Your yacht will be under the care of our skilled and dedicated employees who are routinely checking all boats to be sure the systems are functioning properly and that your boat is secure. Our premises, which are fenced and gated, are in a quiet and peaceful area on an island with no drive by traffic. While your yacht is here, you can arrange to have your bottom painted and the boat made ready for your arrival. You might consider having a special project done or getting that refurbishing done that you have talked about for so long! Consult with our staff and let us help you make a plan. For those of you who prefer to keep your Grand Banks original, using original equipment parts, contact us, for over the years we have purchased a fair stock of obsolete and hard to find Grand Banks parts, as well as stripping older ones of their usable parts before committing them to the grinder. In the majority of cases, the original parts chosen by Grand Banks are among the best available. Many of these parts are unique to Grand Banks of the earlier era and substitutes are hard to find. If you have a particular need for a special part made just for your Grand Banks e-mail us and we will scour our inventory and sources to see if we can provide you with the correct parts. List of some of the parts we have in stock. Imagine yourself on the yacht of your dreams....contact Marlow Marine Sales today.